Home to the world's greatest concentration of World Heritage-listed sites, Iran is historically and culturally one of the most fascinating countries of the Middle East. Its many historic sites date back to the Persian Empire and beyond; there is much to see and do - wander the ancient ruins of Persepolis, marvel at the blue tiled domes of Yazd, and the unique architecture of Masuleh. Explore Esfahan, home to the most majestic collection of buildings in the Islamic world, and Shiraz, considered the heartland of Persian culture. Get lost in the rabbit warrens of the UNESCO-listed bazaar of Tabriz, and visit the Alborz mountain range and the Caspian Sea. Whilst Iran is so well known for its ancient history and civilisations, modern Iran is vibrant and moving forward. However, it is perhaps the most misunderstood country in the world, and arguably one of the modern world's most controversial nations. The focus of this journey is to visit and learn about the ancient treasures of Persia, but also to understand the Iran of today. To find out what it really is like living in modern Iran, walk with the people, visit their homes, and hear from them in the bazaars. Adventure Associates is excited to present you with a comprehensive fifteen-day journey in small groups, travelling by private vehicle accompanied by an English-speaking local expert guide who is passionate about their country and keen to share it with you. You will stay in 4- and 5-star accommodation, handpicked for its local, and historical character and charm, as well as convenient location. Iranian hospitality is legendary and this is what makes discovering the real Iran such a wonderful surprise. Many Adventure Associates' travellers like to make the most of their time away, and this optional 6 day tour of Jordan has become a popular add-on to the Persia to Iran Journey. This extension can be easily added on to your tour in Iran. 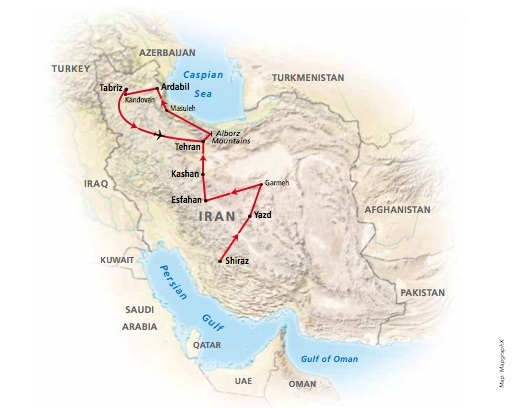 People who ordered Persia to Iran also ordered the free travel brochures below. Click on the images to find out more about these brochures.